San-Chan Nōgyō means everyone works. 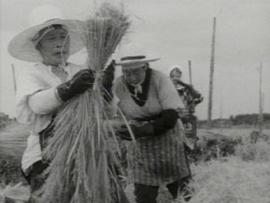 Part-time farming, or kengyō nōka, remains a big part of farm life in Japan. The mechanization of agriculture even on a small scale meant that much less human labor was needed to grow rice. Family members could take other paying jobs, and only help with farming during the busiest transplanting and harvesting times. When the father in the family works at an outside job, often it is his parents and wife who do nearly all of the farm work. This kind of family farming came to be called “san-chan nōgyō” because the farming (nōgyō) is done by grandfather (ojī-chan), grandmother (obā-chan) and mother (okā-chan), the three (san) “chan.” Nowadays even the mother in such a family is likely to have an outside, wage-earning job.